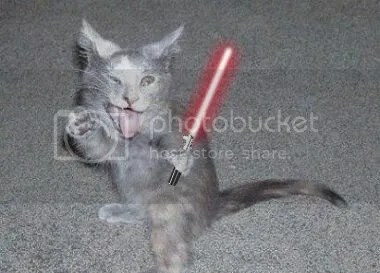 What could be better than Animals with Lightsabers? Not much, really. 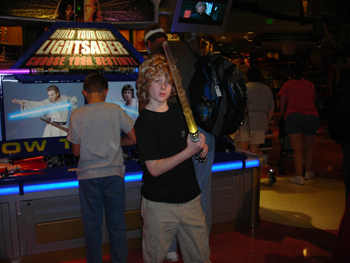 On Monday, December 18, my dear son and I were among the lucky first to visit the new Build Your Own Lightsaber feature at Once Upon at Toy, in the Downtown Disney Marketplace at Walt Disney World. The Cast Members on site seemed enthusastic about the new display, and more than willing to help my son with a few tricky odds and ends. They also seemed somewhat creeped out by my level of geeky excitement, and by the fact that I’d seen the press release the previous week, and blogged about it . . . but hey, I’m forty years old, I’m used to being a geek by now! They backed away nervously when I took out the camera, and I merrily snapped away. So, here are a couple pictures for those of you who might just be weird enough to enjoy them. The main display sign, woo hoo! 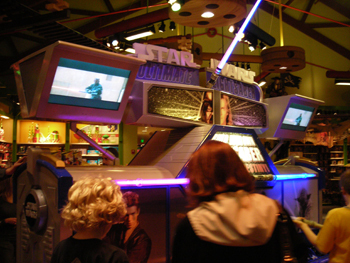 Seen from another angle, with Jedi and Sith alike working away, side-by-side. Instructions are given, step-by-step. Some of the pieces are a bit tricky to put together, though, and the CMs are very helpful. The first section of instructions, including (of course) the price: $19.95. 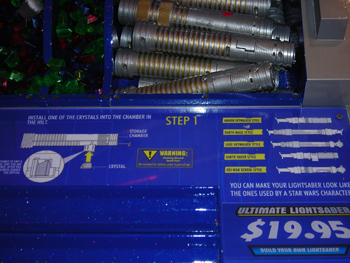 Is this a better or worse buy than the standard Hasbro Build Your Own Lightsaber kit that you can get at Target? Better, IMHO . . . especially if you’re a Disney pin trader. And finally, my darling padawan poses with his new creation. 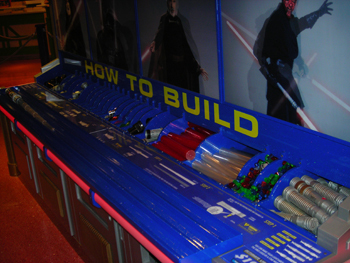 After you finish building your lightsaber, you checkout at the regular counter. They’ll give you the appropriate batteries, plus a “Jedi” or “Sith” Disney trading pin. 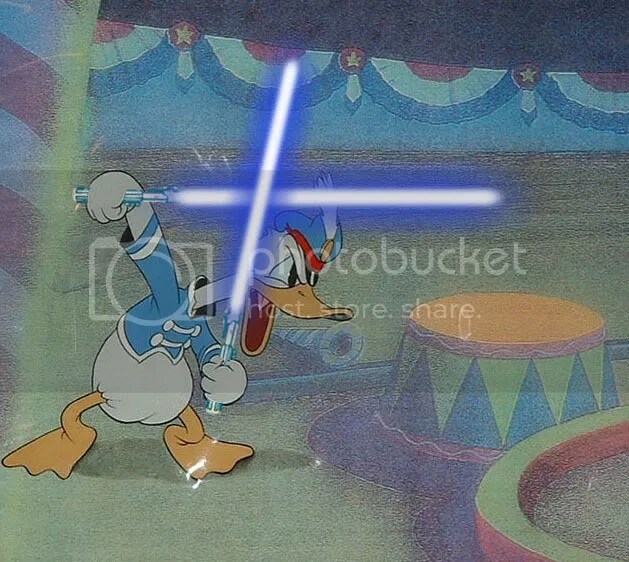 Contrary to earlier reports, there’s no “lightsaber testing” to determine which side you’re on . . . at least not yet. The CM at the register takes your word for whether you follow the path of fear and hate. 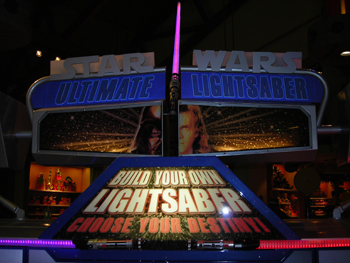 The Star Wars web site has details of a new “build your own lightsaber” retail opportunity (warning, popups!) at the Once Upon a Toy store in Walt Disney World. Sounds like the best part is when the CM tells you whether you’re naughty or nice, now doesn’t it? The toy is currently available only at Once Upon a Toy at WDW’s Downtown Disney, but of course they’re leaving the door open to making it available elsewhere.